Pad Thai. I made it at home so, no takeaway for us! I made this a while back but am just getting around to posting. What a lazy blogger I am :-) This is one of the dishes mentioned in the Lethal White novel by Robert Galbraith. Anytime I read one of the Cormoran Strike novels I crave the experience of walking around their part of London and picking up a curry or having a pub lunch. Same goes for the Inspector Banks novels or the latest series I have started, Shetland. Armchair traveling is fine for now, helps us make a travel wish list. So, would I make this again? Probably but not anytime soon. It's rich and carby, something enjoyed in small doses. The rice noodles I used are Annie Chun's and they were soooo good. My notebook of things to do, to post, read, write and organize is lengthy but I'm hoping now that things are back to normal, I will start checking things off. Having a brutal cleaning out of all the rooms at home is time consuming but well worth it. The yard and field are on the agenda for this weekend. 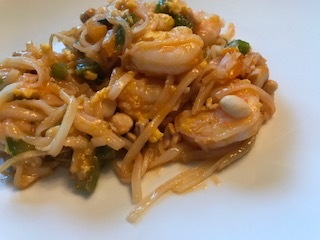 Here is the recipe for this particular Pad Thai. there are quite a few variations out there. 1. In a large pot of salted boiling water, cook noodles until tender, 7 to 10 minutes or until tender. Drain and set aside. 2. In a small bowl, whisk together lime juice, brown sugar, fish sauce, soy sauce, and cayenne pepper. Set aside. 3. In a large nonstick pan over medium-high heat, heat oil. Add bell pepper and cook until tender, about 4 minutes. Stir in garlic and cook until fragrant, about 1 minute more. 4. Add the shrimp and season with salt and pepper. Cook until pink, about 2 minutes per side. 5. Push the shrimp and vegetables to one side of the pan and pour in the egg. Scramble until just set then mix with the shrimp mixture. 6. Add the cooked noodles and toss until combined. Pour in the lime juice mixture and toss until the noodles are coated. 7. 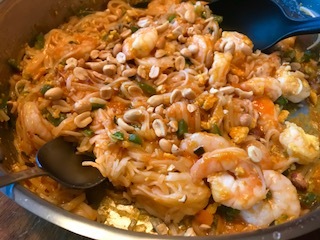 Top with green onions and roasted peanuts. I'm behind on everything too and me no likey! That recipe looks so good. Glad to see you getting back to some kind of normal -- at least cooking! 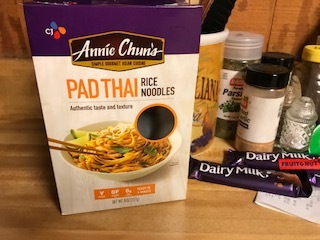 I've never thought of making my own Pad Thai, but your recipe doesn't look super difficult. It's just that we have a very convenient Thai place that makes good Thai noodle dishes! Thanks, Vicki. My goal is to get things rolling along smoothly, finish some cleanup, try some new recipes. Mae - That sounds goo, having access to some good Thai places. This recipe wasn't difficult but it's not one I'd make too often. I can't imagine how much cleaning up you have to do. UGH. Anyway, this looks good and by switching to cashews, I could make this for myself. Oh right, BFR - I forgot about your peanut allergy. Cashews would be great!